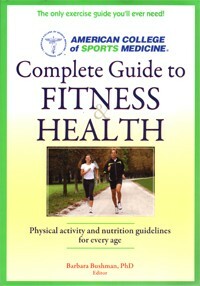 Complete Guide to Fitness & Health, 1st ed. American College of Sports Medicine's Complete Guide to Fitness & Health, 1st ed. is a comprehensive resource on exercise and nutrition for consumers. This is a multi-authored book: no fewer than 22 academics contributed to this book. The editor is Barbara Bushman, PhD. She is an exercise specialist and professor at Missouri State University. She received her PhD in exercise physiology from the University of Toledo. Dr. Bushman has many editorial accomplishments and is a Fellow in the American College of Sports Medicine. The American College of Sports Medicine, editor Barbara Bushman, PhD, and the other authors set out to produce a current and comprehensive guide on exercise and your health. They achieved that goal. In general, this is a very comprehensive book, though there are several notable omissions (see below). Readers who want thorough, detailed, science-based information on exercise will like this book. However, I think many others will be overwhelmed. Those who find the text too much to read can still benefit from the tables and the very good full-color images of real people (ie., not fitness models) doing sample exercises. For example, the tables in chapter 2 which allow the reader to compare their fitness parameters to population norms are very good. Readers should consider photocopying these tables and keeping them handy. Tables 11.1 and 11.2 (fitness norms for the elderly) should also be included in chapter 2 so that the user has them all in one place. But in their attempt to be thorough and detailed, I think the authors overestimate their readers. For example, the algorithm on p. 21 which assesses the risk of coronary artery disease is far too complex for a consumer audience. The discussion of METs on p. 107-108 is a good summary, but is over the head of most consumers. Likewise, the summary of different ways of categorizing nutrient amounts on p. 70 just leaves the reader confused. "Actionable" information is much better than "more" information, especially when it comes to health resources for consumers. The chapter on nutrition (chapter 4), and, Parts II and III are generally good. I think they did a good job with the photos they present in these chapters, however, more detail needs to be provided on balance exercises for the elderly. A table of balance exercises appears on p. 159 while photos of balance exercises are on p. 177-179. Both of these sections need to be expanded, and then combined. Part IV covers exercise in specific medical conditions. Generally, these are good, but why are there 3 chapters on cardiovascular diseases but not one on the benefits of exercise on mental health (cognition, memory, dementia, depression)? This is a major omission, in my opinion. Also, why the authors go to great lengths to explain a physiology concept like METs, yet do not provide any discussion of how resting heart rate relates to a person's vascular health and fitness is perplexing. • The book is thorough (with the exceptions noted above) and authoritative. • The photos and tables are good. • There is too much text, and, some of the content overestimates the reading level of a consumer audience. While the title of book clearly states it is a "Complete Guide," there is just too much text to read. • In addition to less text, the font should be enlarged. (The "PAR-Q and You" figure on p. 20 is reduced in size so small that the font is nearly illegible.) This alone would enhance the readability, and, in turn, the comprehension level of the text. In summary, the Complete Guide to Fitness & Health, 1st ed. is a good resource, but I can't give it 4-stars. While this book is intended for a consumer audience, some of the content is better suited to an undergraduate textbook. Also, the absence of a chapter on the benefits of exercise on mental health, and, a good discussion of resting heart rate, are both glaring omissions in my opinion.